More than seven out of 10 Malawians live below the international poverty line of $1.90/day. Poverty is particularly rife in the Southern Region of Malawi, where for the last 10 years communities have experienced persistent shocks and stresses including dry spells, drought, flooding and, most recently, Fall armyworm invasion. As a result, communities have often relied on food assistance to make ends meet during stress periods. In addition to natural and market shocks, land degradation has played a major role in entrenching poverty. Farmers in Malawi are heavily reliant on rain-fed agriculture and decades of unsustainable practices have led to declines in soil fertility and agricultural productivity. It is estimated that over eight million hectares of land in Malawi are degraded. Against this backdrop, USAID has maintained crucial investments to strengthen food security and resilience in Malawi. Between 2009 and 2014, USAID supported the Wellness and Agriculture for Life Advancement (WALA) program, implemented in eight food insecure districts of southern Malawi. Led by Catholic Relief Services (CRS), WALA implemented an integrated package of interventions including maternal and child health, nutrition, improved agriculture productivity and natural resource management (NRM), access to markets and financial services, and disaster risk reduction. Through a watershed restoration approach, WALA assisted communities to develop NRM plans and implement soil and water conservation practices to restore degraded lands. 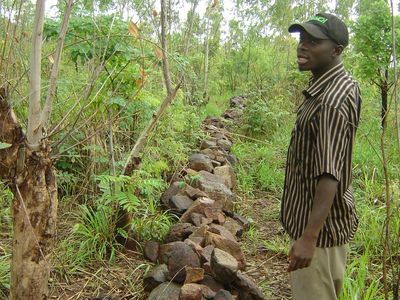 Close to 2,000 km of soil erosion control measures including water absorption trenches, check dams, marker ridges and tree planting were applied over an area covering 2,883 hectares. In 2016, Malawi experienced the worst drought in 25 years with about three million people requiring food aid. Majority of those most affected were in the Southern Region including the eight districts where WALA was implemented. In 2017, USAID commissioned a study to evaluate how the communities targeted by the program fared during the drought. The study found that nine out of 24 communities where watershed restoration was implemented did not require any food aid during the 2016-17 drought. An additional 10 out of 24 communities only needed some food aid during the drought, and most of that food aid was required by non-WALA participants or communities. All in all, WALA participants did not need any food aid in 19 out of 24 communities where watershed restoration activities were conducted. The study concluded that effectively implemented watershed treatments slowed rainfall run-off velocity allowing more water to percolate into the soil. This reduced soil erosion and increased soil moisture protected village and irrigation infrastructure from flash flooding, restored water tables and increased river flow volume and consistency. Communities interviewed during the study reported improved maize harvests attributable to more water available for irrigation, a prolonged production season due to irrigation, improved soil structure, increased soil moisture during dry periods and increased mixed cropping and soil fertility leading to more diverse enterprise mixes. Coupled with agricultural and irrigation scheme development, watershed restoration increased household food production and ability to purchase food and non-food items. The findings provide important lessons for strengthening resilience. The first is that investments to restore degraded lands are critical for helping communities and households withstand and recover from climatic shocks. Secondly, while NRM is foundational, a combination of interventions including improved access to more productive farm management technologies and practices as well as access to markets and financial services is essential. Lastly, restoring degraded lands requires sustained investments in soil and water conservation and strong community ownership. These are lessons that CRS has been keen to apply under the follow-on United in Building and Advancing Expectations (UBALE) program and across its resilience programs. New research from the Feed the Future Innovation Lab for Assets and Market Access suggests a better way to maintain the watersheds feeding Malawi’s power supply could be financial incentives for small-scale farmers upstream to adopt conservation agriculture.